Home • Get involved • Events • Sam’s Jurassic Coast Challenge • Weeks 8/9 – Happy New Year! Weeks 8/9 – Happy New Year! Most people (none of whom have run 3 marathons in 3 days I hasten to add!) said that the week before and the week of Christmas would be the most problematic for me with the training. Fitting it around the social get-togethers, work client dinners, and visiting family 200 miles away would mess with my routine, they said, and I wouldn’t be able to stick to the plan. The reality was that it was really no effort at all, and if anything it was easier given the second week I didn’t have to fit the day job in as well. Add to that the fact that I was able to run somewhere different, and had company for some of the runs those two weeks were some of my favourites of the plan so far. This was the period where my coach took out the rest days from my plan starting 12th December, with the aim of making me run for 24 days consecutively. It seemed daunting to start with but the joy of having an amazing coach is that you can put your trust in him, knowing that he knows exactly what he’s doing and manages your workload accordingly. There were still speed and hill sessions but there were plenty of slower runs as well to ensure my body wouldn’t give up on me. The speed sessions are a bit of a love / hate affair. You know they do you good but they’re pretty tough when you actually do them. The Tuesday before Christmas saw me head down to Regent’s Park in my lunch break with a friend (and fellow Jurassic Coast Challenger) to hit the athletics track for 5 x 1km sprints. It was an exhausting session but I’m getting faster so I’m reaping the rewards. Running on Christmas Day was a first for me! I’ve seen others do it and always thought they were just showing off but this year I joined their ranks – wearing the obligatory Santa hat! The plan only had a slow 5 mile jog against that day and far from being an inconvenience it was actually rather practical for me. The Christmas Morning routine for me has always been to get up and go straight round to visit my nieces and open presents with them. By sheer coincidence they live exactly 5 miles from where my folks live so that easily sorted the Christmas Day run! Boxing Day was a hill session – run 2 miles to a hill, 12 x 20 secs running hard up a hill, walking back down and then a 2 mile run back home. This run was my biggest worry over the break as the only hill nearby wasn’t really that steep but with that as my only option, that was the hill I hit. Upon finishing the session I felt as if I had short changed myself as it wasn’t really that tough and so I decided to redo the session when I was back home in London, replacing it for one of the slower runs. Back in London on the Friday I headed to the hill I was using at the start of the plan, but I was surprised to see when I got there that it seemed flatter than I remembered it. As the plan has gone on I’ve replaced that hill with Primrose Hill which is a beast of steepness, so it was quite a shock to find that my original hill which used to be a tough workout is nothing more than a small mound! To add insult to injury, when I looked at the elevation stats on my running watch after it turns out that the London hill was flatter than the Boxing Day one – doh! The rest of the festive runs were nice slow sessions allowing me to take in the beautiful scenery in Cheshire which made a change from my usual London routes. The weather was kind to me and if it was too cold, the bright blue skies more than made up for it. I even saw a haystack sculpture of Peter Rabbit pulling up a carrot! 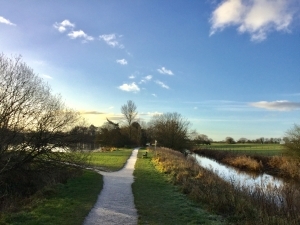 The year ended with an 11 miler along the River Lea going further up the path than I had gone before on New Year’s Eve before an early night ready for the New Year’s Day Parkrun. Across the two weeks I managed to clock up 92 miles of running, and with one final week of Phase 2 I’m ready for the challenges that Phase 3, and the increased mileage will bring.